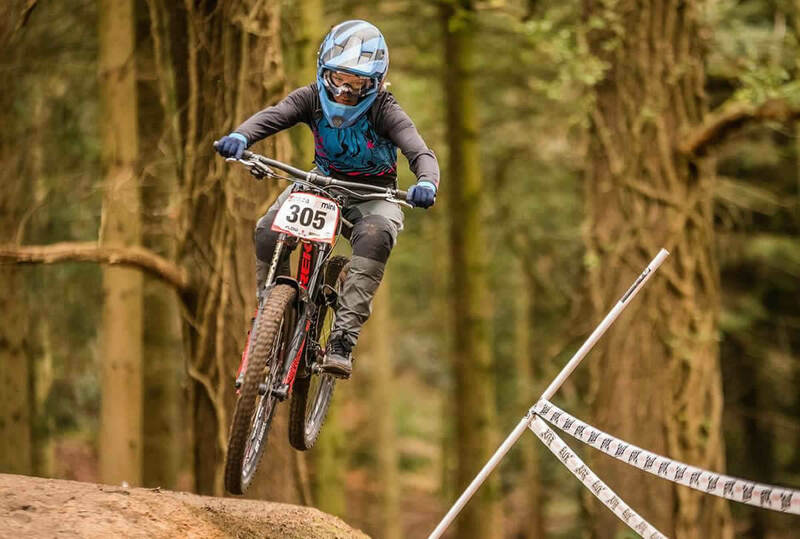 After riding an uplift on the Saturday in South Wales, I arrived at the Forest of Dean late that evening ready for a good night’s sleep to get in as much riding before the race runs the next day. Waking up early Sunday morning and having only an hour and 45 minutes to practice I was slightly stressed; but once I got riding it didn’t seem so bad! There wasn’t anything too technical or too many line choices so I was happy spending most of practice just sessioning the top right hand turn that everyone was having trouble with, including me. The Ski Run track is short and sweet and I was looking forward to injecting a bit of pace into it for my race runs bearing in mind I hadn’t managed to fit a full run in before racing… oops. I decided to take my first race run as a practice run, not too nervous at the top I was ready to roll and excited to get riding. I came down into 2nd place. I wasn’t too happy with the run I had, not so much because I had made mistakes but because I felt really tired; not sure what was up with me I ate some grub and took an energy gel before my second run hoping I’d be sorted out. Feeling a little more alive I took myself up to the top for my next race run not leaving myself too much time to sit around up there as I knew the nerves would get the better of me. I kept myself warm for my second attempt, set off and felt good when I was riding. I made two errors – a huge sketchy moment coming out onto the fire road at the top where I almost came off and very much scared myself, and further down towards the bottom where I almost rode off the track but managed to somehow save it both times. Reaching the bottom was a relief but overall I was happy yet disappointed at the same time, 2nd is a good place to come but I wasn’t 100% happy with my time or satisfied with my run. Always room for improvement! So relieved to get back racing after a break, and so ready for the next round. It was amazing to see so many girls on track racing, we need to keep the numbers up to get the sport more known. Well done to everyone who raced.